The 94th ‘s first assignment on the continent for their first 106 days of combat was a holding action around the isolated ports of St Nazaire and Lorient. 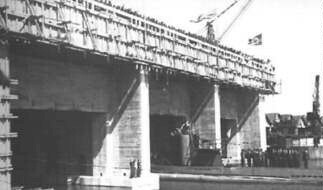 The other major port facility at Brest was captured by General Patton’s forces in August. This "Forgotten Front" was far away from the major campaign in eastern France but it was extremely necessary to contain the troops there, that would otherwise attack the Allied Armies from behind. The pockets of St Nazaire and Lorient were for the most part exact opposites of each other. Lorient was surrounded by heavy forests and the mountains ran along to the sea. Numerous hills and ridges provided the Germans with good visibility of the countryside and the enemy would deployed its artillery on these positions and rain down death and destruction on the Americans surrounding them. At St Nazaire the 700 square miles of German territory was flat and swampy, almost devoid of trees. Water barriers almost completely surrounded the city and provided the Germans with an excellent defensive position. The city could be approached on dry land only from the east, and the enemy had turn that approach into a veritable fortress maze of pillboxes, machine gun nests, barbed wire obstacles, and roadblocks. The approaches were zeroed in with pre-ranged artillery and machine gun kill zones and there were minefields everywhere. Sunken roads and hedgerows like the ones encountered in Normandy were present throughout both areas. During the fall season the rainfall was extremely heavy and the ground became saturated and muddy. Many vehicles would become bogged down in the soft earth, and the roads would turn into a quagmire. The inclement weather coupled with the muddy terrain would make the GI’s life in the trenches miserable. 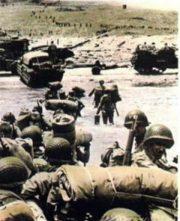 Some 22,000 to 25,000 enemy troops were located in Lorient and an additional 35,000 troops were isolated in St Nazaire. These troops bypassed by the allied armies as they swept through France in their race toward Germany consisted of a variety of forces. The troops consisted of Kreigsmarine Naval personnel, Luftwaffe Air force personnel and Fallschirmjaeger paratroops. The Army’s forces consisted mostly of Artillery men from the coastal batteries and loose units of infantry. In addition to these the Germans had some service troops, Luftwaffe cadets, labor units, and a few bicycle troops. There even was a contingency of Russian “Volunteers” which initially were located in the front lines but were later removed due to their tendency to liquidated their German Officers and desert. These pockets of German soldiers, though cut off were none the less dangerous. The Germans were fully supplied, entrenched in their positions and well led. The Commanding officer of the German forces in was General Der Artillerie Wilhelm Fahrnbacher. After the fall of Brest he was the senior ranking officer in Brittany. His HQ was located in the Lorient pocket. He along with KonterAdmiral Kaehler and other senior members of the Whermacht were determined to hold out. In the St Nazaire Pocket the Commanding Officer was Generalleutnant Hans Junck former Commanding Officer of the 253 Infanterie Divisionen in Russia. To assist him in his defense of the St Nazaire pocket was KonterAdmiral Mirew of the Kreigsmarine forces, and GeneralMajor Huenten formerly of the 275 Infanterie Divisionen. Besides the defenses built up around the pockets the Germans had approximately 500 pieces of artillery available to use in the Lorient sector. 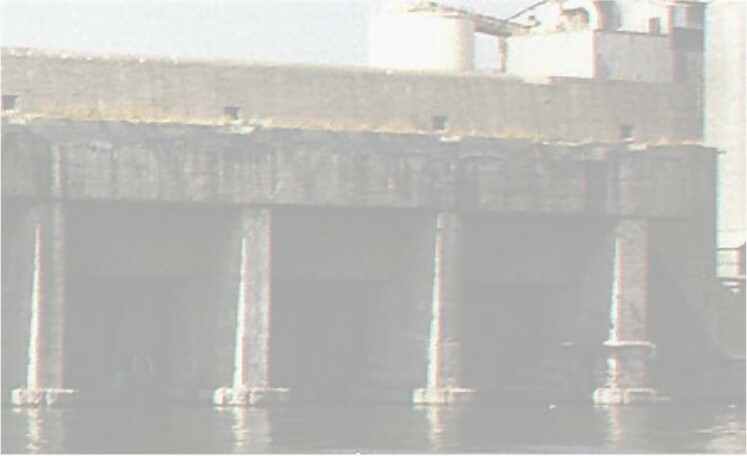 Three hundred pieces were fixed coastal batteries, but the remaining 200 pieces were of the mobile types. The weapons ranged in Caliber from small 20mm AA guns to huge 340 mm coastal defense weapons. Artillery in the St Nazaire sector consisted of approximately 536 pieces of similar assorted calibers. There was plenty of ammunition available for all the pieces and it was used very liberally. Isolated would seem hardly the proper term for these sectors. Although physically separated from each other, both locations maintained contact through surface craft along with radio and air communications. Furthermore, the cities were re-supplied successfully by submarine from Spain and Germany. 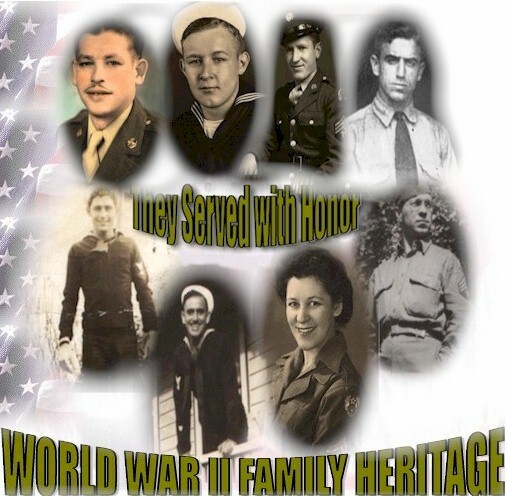 The 301st Infantry Regiment under the command of Colonel Roy S. Hagerty has the honor of being the first unit in the 94th to go into combat during WWII. 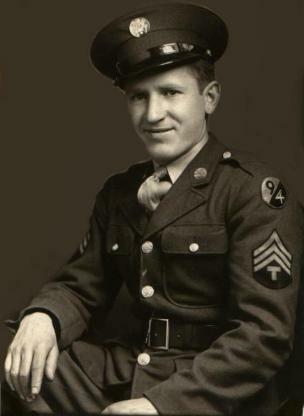 Hagerty, a graduate of the ROTC unit at North Dakota State University had been in the Army since August 1917, serving in various units throughout his career. After relieving the 6th armored division of it’s positions in the Lorient sector the 301st set up their own positions along the front lines near the towns of Quimperle, Redene, Pont Scorff, Hennebont, and Nostang. The first contact with the enemy was on September 10th when Company K came under fire from a small enemy thrust after the GI’s occupied a forward Observation Post (OP). The attack was repulsed with no casualties. Later that day 2 members from Company E were killed by snipers.on the following day the first prisoners were captured by Company B and turned over to the Division’s Interrogation Platoon. Later that same month PFC Dale Proctor K/301 earned the first Distinguished Service Cross when he was mortally wounded while manning his post during an artillery barrage directed at his OP. He calmly remained at his post giving fire direction despite his wounds. The 302nd Infantry Regiment under the command Of Colonel Earle A. Johnson. Johnson was born in Neosho Missouri and graduated from Drury College in 1915. He served with the National Guard and was commissioned a 2nd Lt. in 1917. During World War I he served with the 90th Infantry Division and was wounded in action. The 302nd Regiment set up in the Lorient sector on September 15-16. The first casualties happened the day it entered the line. The Germans laid a barrage down on the regiment while they were occupying the positions near Grand Champ in the Scoff River-Caudan area. One man was killed and three were wounded. On September 19th a patrol from F Company stumbled into a prepared German position. Four of the enemy were killed and ten prisoners taken including an officer. 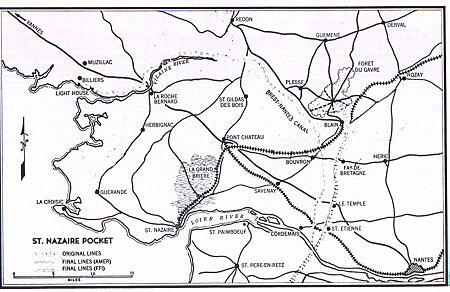 The 94th wasn’t finished with occupying its assigned positions around the Lorient pocket when an order came down extending the divisions responsibilities to the St. Nazaire Pocket. The Division was split as Assistant division Commander Brigadier General Henry B. Cheadle assumed command of Task Force Nantes. Cheadle was born in Cannon Falls Minnesota and graduated from the USMA in 1913. He commanded the 16th Infantry Regiment of the 1st infantry Division (Big Red One) in North Africa prior to his assignment to the 94th. Under General Cheadle’s command was the 376th Infantry Regiment, 919th Field artillery Battalion, 473rd AAA battalion, Company C, 319th Engineers, and Company C, and 1st Platoon, Company D, of the 319th Medical Battalion. In addition the General had command over several battalions of the Free French Interior (FFI) irregulars. 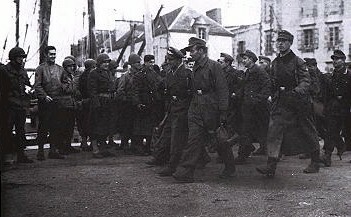 The 376th Infantry Regiment under the command of Colonel Harold H. McClune was immediately sent from the assembly area in Rennes to Nantes to relieve Uncle Rolland’s 331st Regiment of the 83rd Infantry Division of its positions. Colonel McClune was born in York, Pennsylvania. He enlisted in the Army in 1911 and was assigned to the 13th Calvary during the Mexican Border war. He was commissioned a 2nd Lt. In 1917 and fought with distinction in six campaigns and was wounded in action during World War I. It didn’t take long for the 376th to receive its first casualties. On the night of September 17th the Germans sent a “Present” to the newly arrived 376th. The enemy loaded an empty boxcar with explosives and rolled it down the Railroad tracks into the town of Blain where the 2nd battalion of the 376th was located. The blast killed one man and wounded several others. After September 17th the 94th had assumed control of the entire Lorient-St Nazaire pockets. 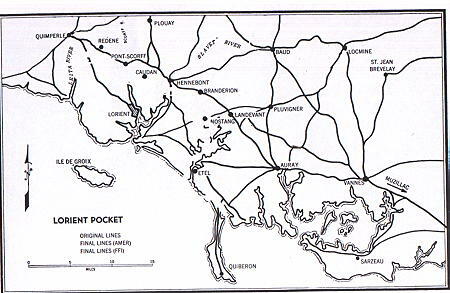 On September 22nd ,the 2nd and 3rd battalions of the 302nd were relieved at Lorient and moved to the St Nazaire sector. The division would remain in these positions for the next 65 days ntil the divisions boundaries were extended all the way to Auxerre, France. The 94th was now spread very thin, over 450 miles lay between Lorient and Auxerre. General Maloney was concerned with only a battalion in reserve for any hotspots that might occur. He requested and received assistance from the 15th Calvary Reconnaissance Unit. This unit with its armored cars and light tanks would be able to assist the 94th should the enemy try anything. The next several months the 94th would continue its containment action against the Germans in the Lorient-St Nazaire pockets. General Maloney mindful of his duties and frustrated at his orders not to engage the enemy in an offensive action decide on another course of action. He decide to commit the division piecemeal by indoctrinating them through patrolling. By sending out small patrols to encounter the enemy the 94th would receive the combat training it needed for future offensive operations. Several of the patrols came under intense enemy fire and the GI’s of the 94th were learning their trade first hand. One such patrol occurred on October 2nd. K Company 301st ran into an enemy ambush and the entire patrol was wounded, killed or captured. Other patrols were more fortunate as some of the greatest acts of bravery were recorded in the 94th’s entire history of the war. On October 3, 1944 2nd battalion 301st a routine patrol penetrated the line approximately one mile. The patrol was brought under heavy machine gun fire from an enemy strongpoint. 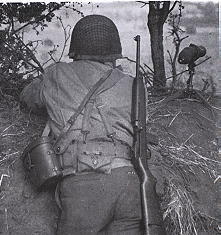 PFC Herbert Austin disregarding his own safety charged at the machine gun nest over open ground. 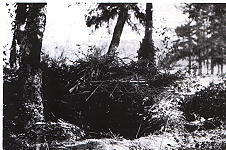 Upon reaching the site he fired his Browning Automatic Rifle (BAR) several times killing all five Germans at the nest. His fearless action allowed the patrol to continue its assigned mission. For his actions he was awarded the Distinguished Service Cross. Through out the rest of October and November numerous patrols took place as the GI’s from the 94th continued their mission of keeping the Germans penned in. The 94th continued its monotonous routine of patrols and artillery barrages of the enemy’s lines of defense. General Maloney realizing that the combat effectiveness and the morale of his men were slipping away by remaining on a static front repeatedly requested to transfer his division or permission to launch small scale attacks on the enemy’s vulnerable positions. His requests were repeatedly denied, and he was ordered to continue his mission of holding the enemy in its position. On December 7-8 General Maloney was given permission to attempt and isolated the two pockets even further by splitting them apart. 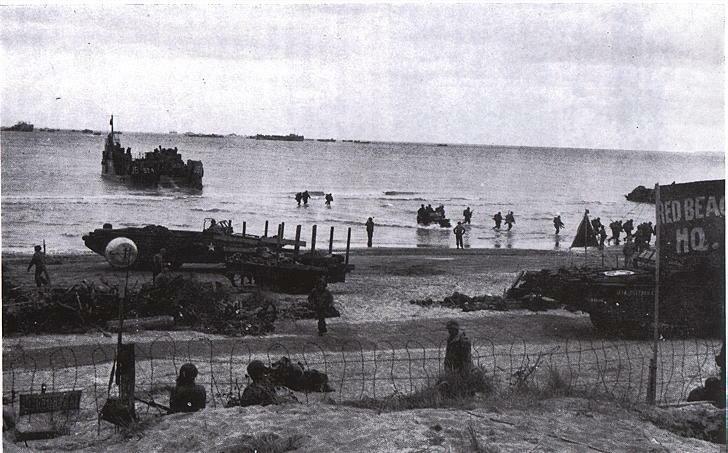 A force consisting of the 3rd battalion 301st, the regimental anti-tank company and a company of the 319th engineers was assigned the task of clearing the Germans from the Quiberon Peninsula. Field artillery support was provided by the 390th After an artillery barrage that lasted for ten minutes the attack began at 0833. The engineers worked all night to clear the mines from the area. Using flamethrowers and antitank gunfire two companies managed to reduce the strongpoint of nine pillboxes and capture over 50 prisoners. The Americans losses were two dead and four wounded. This would be the only coordinated action the 94th would have in Brittany. On December 16th the Germans started their Ardennes offensive and things would change for the 94th. 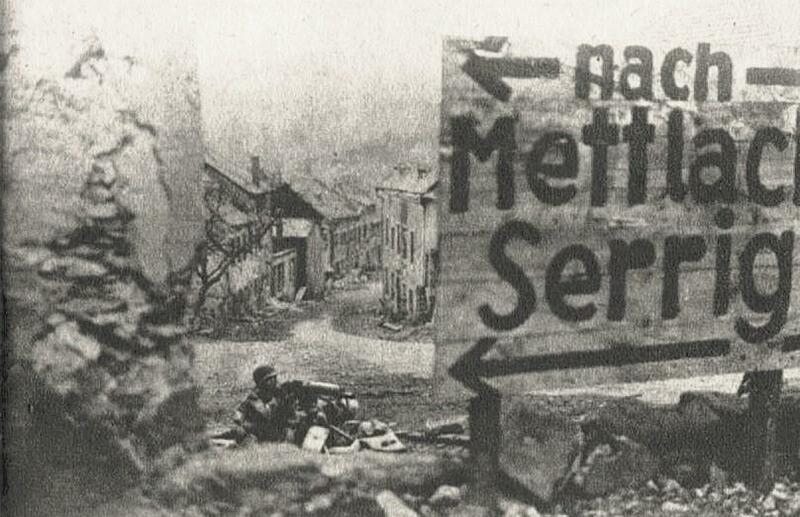 Two prisoner exchanges took place between the 94th Division and the Germans in the isolated pockets. Mr Andrew Hodges the American Red Cross representative assigned to the 302nd Infantry was the chief coordinator for the exchanges. On November 17, 1944 he arranged a ease fire between the Americans and the Germans in order to negotiate a prisoner exchange in the Lorient sector. After close inspection the Germans accepted 71 men for exchange. Most of the men were from the ill fated patrol from the 301st Infantry, with some prisoners from the 6th Armored and 83rd Infantry divisions. A second prisoner exchange was arranged on November 29th in the St Nazaire sector, fifty three service men were repatriated. On December 15th and 29th two more exchanges took place with a total of 140 allied soldiers liberated. The time the 94th spent in Brittanty was a complete success. During the period of the Divisions stay in Brittany, the men of the 94th contained over 60,000 enemy troops. Further, they inflicted an estimated 2,700 enemy casualties and took 566 Germans prisoner. The 94th lost only 100 men Killed and 618 wounded with only one man listed as MIA and unaccounted for. On December 5th the 94th received new orders and the 94th would be relieved by the 11th Armored Division on December 29th. The 94th thought it was was finally “On the way” Just when the 94th thought it was going to be relieved by the 11th Armored division, fate intervened. The German offensive in the Ardennes necessitated the rapid deployment of all available divisions. So the 11th Armored immediately went into action in Belgium and the 94th was to stay in Brittany - but not for long. ARDENNES-ALSACE: The "Siegfried Switch Line"